Advantage Multi for cats prevents parasite infections, fleas, heartworm, gastrointestinal worms, lungworm and ear mites. With a single dose a month, your cat will have the best protection money can buy, without you having to break the bank to get it. Does this product treat Round Worm? Yes, Advantage Multi (Advocate) treats roundworm. 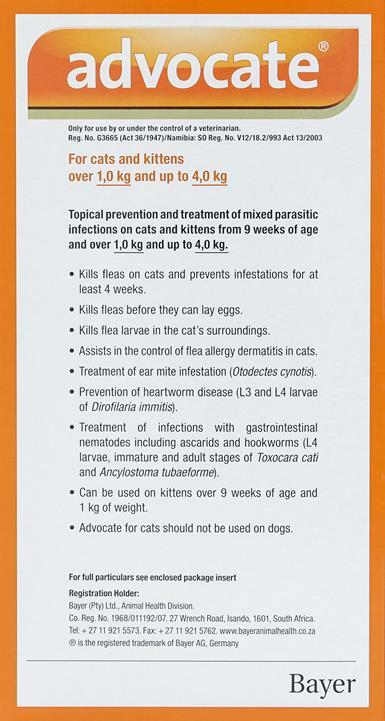 Is the advocate flea heartworms and worms for cats under four kgs suitable for kittens weighing 1.8kg and 10 weeks of age. This product is safe for cats over 1 kg and older than 9 weeks. So you can use it on your cat. Can I cancel auto=delivery for over the winter? Yes. You can cancel auto delivery anytime without penalty from My Account->Recurring Orders when logged in at www.petbucket.com, toll free at 855 908 4010, emailing [email protected] or via live chat. Great product, good price and customer care. My most recent order took over 4 weeks to arrive what with Christmas etc but here now and always friendly emails from the staff. Many thanks. Great flea meds. Had no fleas in the house.